LCD monitor is becoming more and more popular and is much cheaper compared with other monitors. So why not just purchase this converter and use LCD monitor for your games. It will bring you a lot of benefit. This is a professional game converter. Support all games(Amusement\Playstation\xBox\Wii) convert to CRT monitor\LCD monitor \PDP monitor. 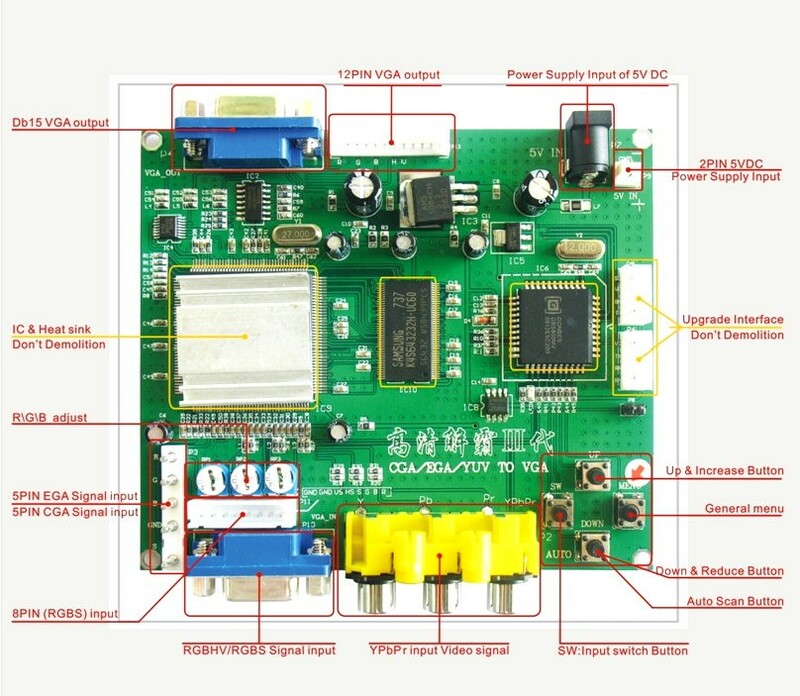 Auto scan CGA/EGA/YUV input signal, and with VGA output, output high resolution signal. This is only for arcade game use, not for industrial or old computer device use. (1) Supports CGA/EGA/YUV signal input. (2) Supports VGA output 640*480, 800*600, 1024*768, 1360*768. (3) CGA/EGA signal auto scan(15K, 24K, 31K). (5) Chinese and English OSD. (6) Supports position control & zoom control. (7) True digital 24-bit A/D converter for true 16.7-million color conversion. (MENU) open OSD menu, and enter. Press this key auto scan CGA/EGA signal. Press this key over 5 second and release reset system. Please don’t adjust this button, excepting the monitor have black item, or picture discoloration. More functions control please look to OSD to operation.